Sole is a surreal adventure game where you play as the only source of light in a world shrouded in darkness. Wander through uninhabited environments, painting the land with light as you uncover its mysterious past. Explore the remnants of great cities and discover the history of an ancient civilization on your journey to restore life to an abandoned world. Get a sneak preview of the full game with our alpha demo builds below. As a brand new indie team, we would absolutely love to hear what you think! Please drop us a line here in the comments or over on Twitter, Facebook, or Discord. The demo builds have yet to be fully optimized and may not run very smoothly on your machine. You can adjust a handful of visual effects in the settings to improve performance, but if the game still chugs a little, know that there are plenty of optimization tricks we haven't got around to implementing just yet. Whew! This took me a while to finish :P I enjoyed it in the end and I'm looking forward to what the full game has in store. Keep it up devs! Ahh, I'm getting flOw / Flower vibes from this. Just wandering around, gradually exploring the landscape. So peaceful, but with little spark of mystery to keep us engaged. Very clever, and very well done. I really enjoyed this little sneak peek, especially having to figure things out on my own. Love it! Unlocking something new feels so much more rewarding when you have to work so hard for it =) keep up the amazing work, looking forward to the full release! Can't wait to show y'all what we've got planned for the full game! Thanks for taking the time to check it out! Amazing Demo, This game is one beautiful and amazing. For this being a demo is just stunning but theres a optimization issue here but you already have that in plan to be fixed so keep up the amazing work and can't wait to plat the full release of the game. I really wanted to try the game, but there is something wrong with the camera contrals. Nethier my mouse no my contorller can turn the camera around. Not sure what's wrong. Hmmm, so sorry for the trouble! Maybe check your USB devices to make sure there isn't anything the computer might be reading as an extra controller? You should definitely be able to control the camera with the right mouse button. This was fun. A very peaceful game that lets you take things at your own pace, making your own path in the world, and provides some really nice sounding music for the trip. I could definitely see myself spending a few hours just poking around in a full version of this. A jump feature would be nice though. I felt...restricted. Good job on this and on getting funded. You're welcome for the kind words. Thanks for the game/demo. Hope I presented it well. Personally, I'd be fine with a jump feature even if it didn't accomplish anything beyond added aesthetic and gave the feeling of "trying but going nowhere," but I can understand your reasoning. I've played a lot of marble games, so I'm actually used to legless things jumping...though that's not saying I never questioned it, heh. Hehe no Linux yet! But one of our biggest goals with Sole is to make it accessible on as many platforms as possible, so we'd love to add Linux support. Nobody here on the team is super familiar with the OS so it'll take some research, but we know our engine and tools support it so it's definitely possible. We'll make sure to keep ya updated on any news! This game was truly so much fun. It was super relaxing and I loved exploring and lighting up the old ruins. It was so beautiful and mesmorizing, truely. I did make a small gameplay video for it on my gaming channel (though I don't think it anywhere near does the game justice), I'll link it below and if you got a chance to check it out I'd really appreciate it. Thank you for creating such a beautiful game! I would love to try out this game, but I can't figure out how I'm supposed to move. The Help screen says to use the analog sticks, but no keyboard has analog sticks. I am using Windows 10. Mouse only: Left click & drag up/down on the screen to move forwards/backwards. Right click & drag to orbit the camera. You'll move whatever direction the camera is facing. Mouse & Keyboard: Same as above but you can also move using WASD or arrow keys. Gamepad: Left stick to move, right stick to look around. I have uploaded a video to youtube and a spec list of the PC I used when playing if it helps! Would this run on an Ivy Bridge i7, 16gb ram and a weak 512mb GT 650m? Very interested in this project. Really pretty design. Hmmm I'd think so! From our very basic preliminary testing, the game is more CPU intensive than GPU thanks to how we're doing the lighting effects. If you get a chance to test it out, we'd love to hear how it runs! Awwww thanks! Truly means a lot to us. quick question... is the language English based? by that I mean 26 symbols translating into english words... it's ok if you don't want to answer. Thanks for the feedback! We'll definitely look at ways to make the mouse-only controls a bit easier to manage. Maybe using the left mouse for only movement and right for camera? We were trying to go for a one-button control scheme, but know it can be a little frustrating at times. Here you are, looking forward to the full experience! I'm working on a video for this, but I wanted to say beforehand. Wow. I was not expecting to be as drawn in as I was. Really beautiful demo you have here. Wishing you best of luck on the kickstarter, you have my support. The rest of my thoughts (much more in-depth) will be in the video. Hey thanks so much! 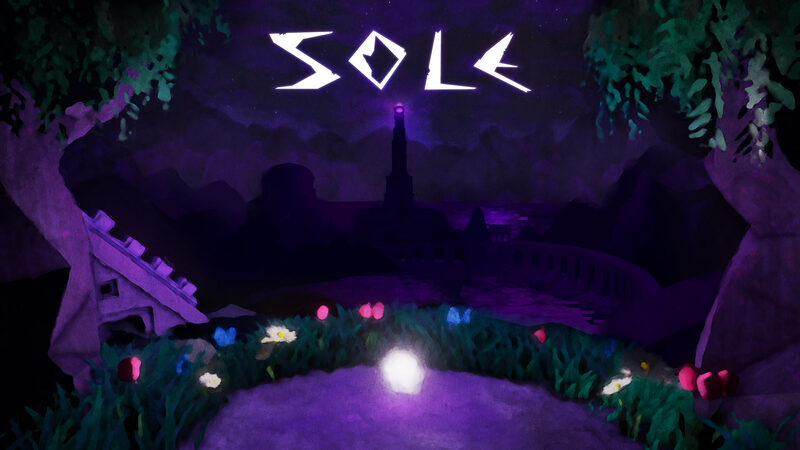 Our goal here was to create this hypnotic, dreamlike feeling that really draws players in, so hopefully we'll be able to capture that with Sole. Can't wait to hear your full thoughts! Wish I could go through that door. :) I hope you reach the KS goal.